garvey cey russell lopes: where are the walter o'malley cards? baseball cards usually feature players. that makes sense. sometimes, though, managers get their own cards. sometimes, coaches are featured. topps, for a couple of years, produced cards of the league presidents. these days, even mascots are getting their own slice of cardboard. and, thanks to legendary cuts, i own cards of a couple of executives (branch rickey and al campanis) and other pioneers of the sport (such as abner doubleday). 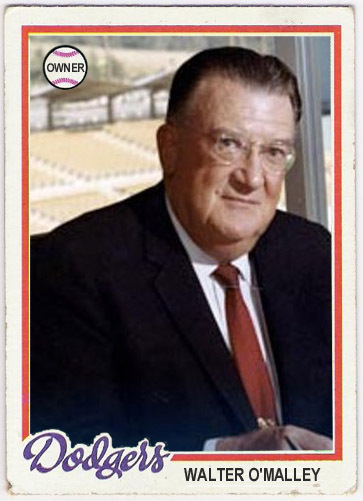 but, while i am bracing myself for some sort of george steinbrenner tribute next year, i don't believe any cards have been made for team owners. certainly not for walter o'malley. all he did was help expand the sport. keep the dodgers in brooklyn, indeed. 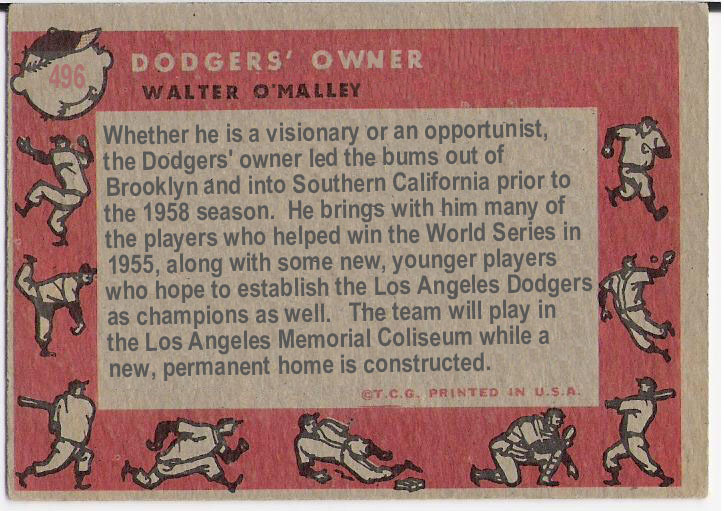 the dodgers moved to los angeles in time for the 1958 season, with o'malley orchestrating the move. 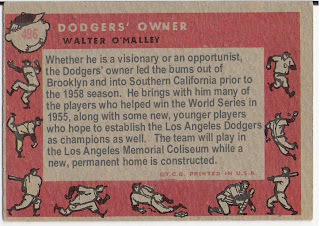 he had taken control of the team at the end of the 1950 season after having first purchased an interest in the team in 1945. the easy story is that o'malley wanted a new stadium in brooklyn but was rebuffed and los angeles was willing to 'play ball', so to speak, with a land deal. he convinced the giants to move to the west coast rather than the twin cities, and the rest is history. it is more complex than that for sure, but you can delve into it at walteromalley.com or some other source at your leisure. a nice shot of him in his office overlooking the left field pavilion. "successful on-field performances were a mainstay during the stable tenure of walter o’malley. in fact, as president of the brooklyn and los angeles dodgers from 1950-70, the dodgers finished in first or second place in the national league 12 out of 19 times. 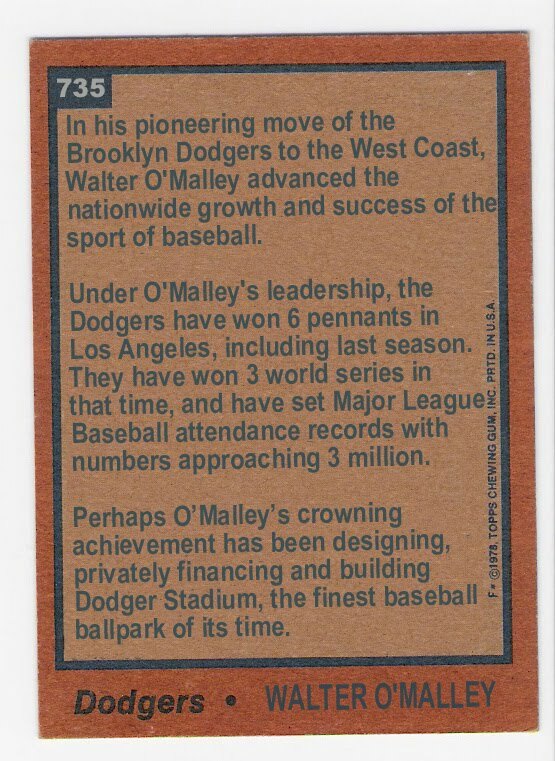 add to that, the 10 years in which o’malley was dodger chairman of the board and the dodger teams finished in first or second place on eight more occasions. with postseason appearances in 1952, 1953, 1955, 1956, 1959, 1963, 1965, 1966, 1974, 1977 and 1978, the dodgers were one of baseball’s most prominent teams in the era. 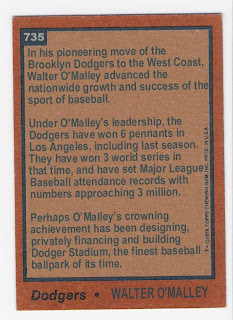 four dodger teams won world championships, including the first and only title in brooklyn in 1955. the other world champion dodger clubs in los angeles included 1959, 1963 and 1965 under walter o’malley’s leadership. while o’malley employed only three managers in 29 years, the dodgers possessed some of baseball’s most recognizable stars, including hall of famers pee wee reese, duke snider, jackie robinson, roy campanella, sandy koufax, don drysdale and don sutton." here's to you, walter o'malley, and your cards that should have been! 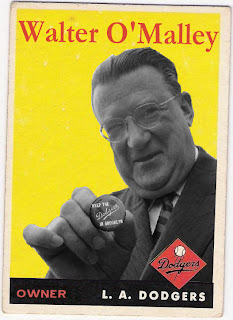 I made a card of O'Malley for when he was inducted also. I will scan it and send it to you. I also collect a card of every HOF inductee, but only since '57 when I was born, so I have had to make several cards. Got the card today. Very cool. The "gum stain" keeps sticking to other cards. I gotta get Walter into his binder spot ASAP. Thanks.